Fremantle Media Australia presents Comedy Slapdown, a new live improv comedy show coming to ABC later this year. Think celebrity theatre-sports with all the pace, drama and unexpected fun of American wrestling. Played out on a huge set with six players on each team, it's a fast-paced battle of wits as random games are thrown at them by king-of-the-ring, HG. Chroma were brought in to produce the huge graphics package for the show including brand design, game graphics, projection content and animated titles. 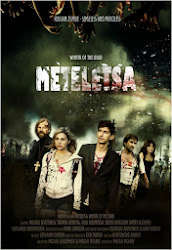 The show also features music by Yuri from Kinesound who also provides the sonic fun on Newstopia. 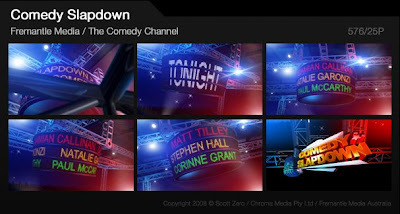 Comedy Slapdown is scheduled for 12 episodes and will air Q3 2008 on The Comedy Channel.